This version contains practice/revision questions from the CIMA 2015 (CIMA professional level) or 2017 (CIMA certificate level) syllabus. Visually, it looks just like our 500 Q&A package. Each package contains one chapter of free questions (20-30 qs) and a sample mini mock with 8 qs. It is free of charge so you can check how the tool works and decide whether you would like to upgrade. Our questions are of the same difficulty level as the real exam. Our group of business experts has collaborated to create high-quality, relevant and entertaining questions and helpful, descriptive answers. We believe that YOU learn the most by putting your knowledge into action, by practising questions and then reading the answers to learn from any mistakes. The Free Questions Package is well differentiated. Because of the different question types and different levels of difficulty, we also use scaled scores, just like CIMA does in the actual exam. The questions are based on the chapters from the official CIMA publishing materials (Kaplan), and no, our questions are not the same as Aptitude. We have created them ourselves. Everything is clear and transparent so that you can focus on the areas you need to improve. 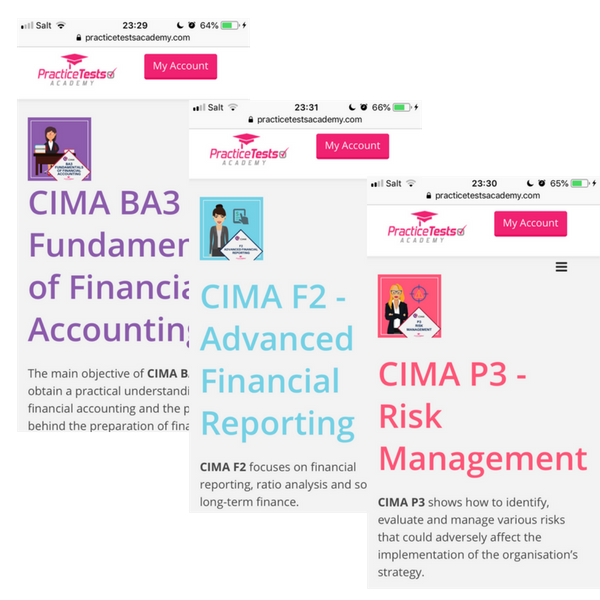 Each CIMA FREE Practice Questions Package consists of 1 chapter of questions in study mode (20-30 questions) and, additionally, we have prepared a mini mock with 8 questions taken from different parts of the paper's syllabus. All of this available for every paper that we currently offer. 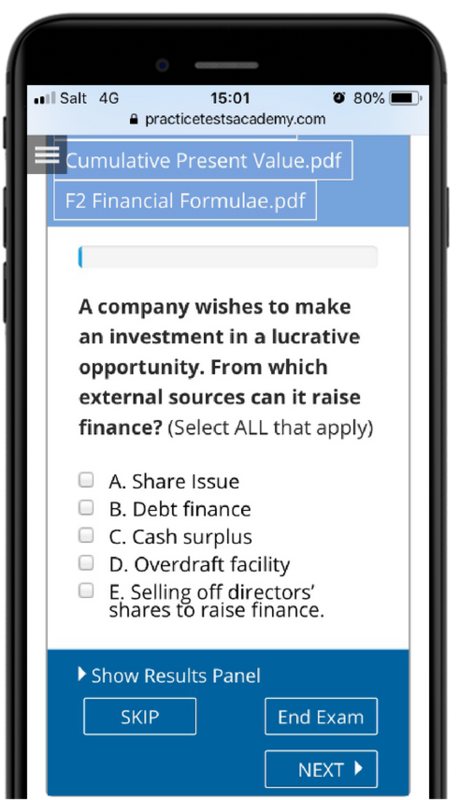 The questions were prepared for YOU by a group of world-class tuition providers and business experts so that you can test the tool before you decide to purchase it. All CIMA levels covered. Roughly 30 high-quality Q&A per paper. 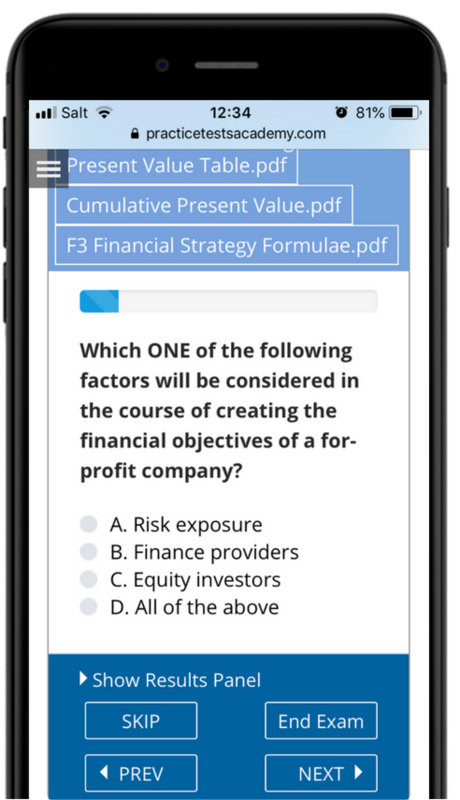 These practice questions are completely free and you'll get instant access. CIMA Free Packages are designed for interactive online practice. Latest CIMA 2015 or 2017 (BA) syllabus, updated according to Kaplan's 2018 release. 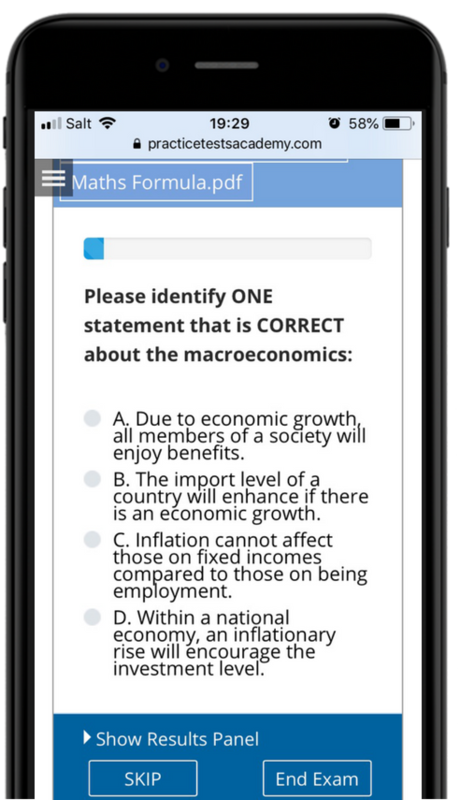 You can practice tests in both study mode and exam simulator - as tough as the actual exam questions. Practice whenever and wherever you want. You have access 24/7. Why is it a must to practise the CIMA exam? You will be able to practise more than 500 questions per paper if you decide to purchase our products. Again, the more you practise, the more you reflect on the questions you have completed and understand the reasons why you got wrong those you failed, and the higher your chance of passing. I just passed F3 through the help of your question bank. A number of questions I got in the exam were very similar to the ones I'd practised with Practice Tests Academy. To be able to provide so many questions and of such high quality is truly remarkable. I highly recommend your product to anyone attempting any CIMA paper. Keep up the good work and thank you for your support. I look forward to using your product for the E3 paper as well. I'd also like to thank you for your website, and the many different products you offer. I bought the P2 mock exam back in October as I had failed the real exam a few times and felt I needed some more help. I then failed it again and was starting to get frustrated. I went on to your website to see what else I could do and found I could upgrade the mock to the 500 Q pack and also had a discount code, so that was perfect. I went over questions in every syllabus area, and that seemed to do the trick as I passed the next exam. I will be looking to continue that through 2018! Get a glimpse into most popular CIMA free packages. 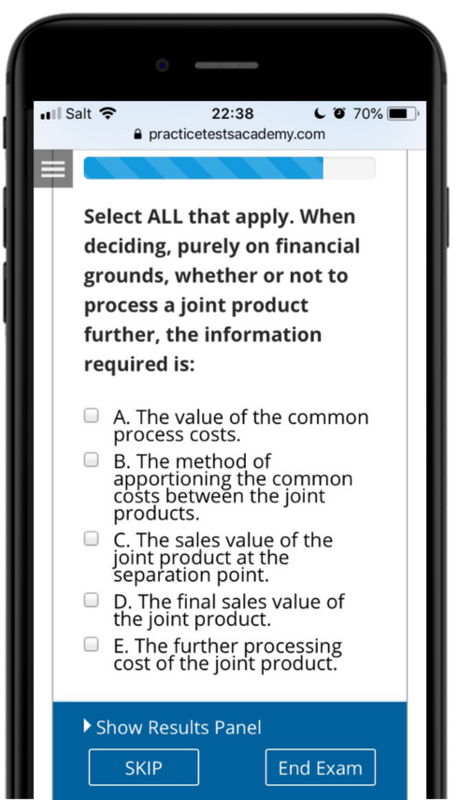 Practice Tests Academy has created the only practice kit available online with so many great questions to practise. 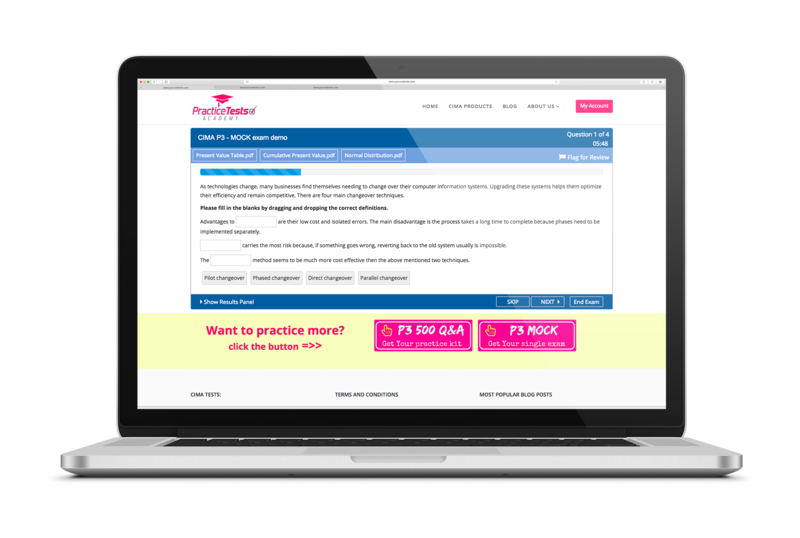 Increase your chance of passing first time by practising as many questions as possible. Practice makes better!